Though BJP has donwplayed its part in the merger of the two factions, party leaders have made it clear that they were keen that the two groups come together. New Delhi: The AIADMK will soon join the NDA and be a part of the Modi government at the Centre, a senior BJP leader has said. It is only a matter of time before an announcement is made on this, the BJP leader, who is a key party functionary involved with the southern state's affairs, said. He also played down the rebellion by a group of AIADMK MLAs, who owe allegiance to TTV Diinakaran, against Chief Minister K Palaniswami, claiming that it was more an internal matter of the regional party and not a threat to the state government. 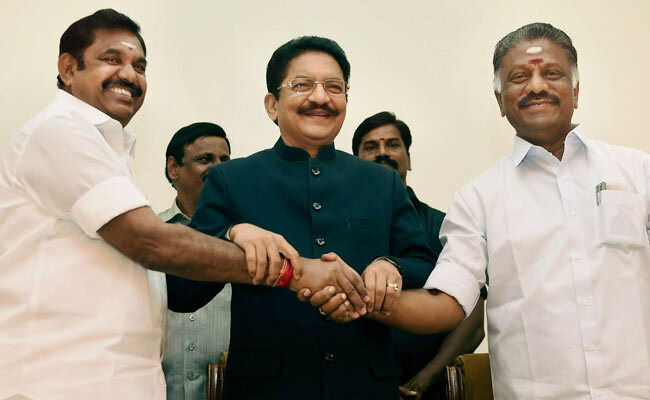 Following the recent merger of two AIADMK factions headed by Palaniswami and former Chief Minister O Panneerselvam, the party has been hit by fresh dissent with a group of MLAs rallying behind Dhinakaran, whose aunt, V K Sasikala, is the AIADMK chief and in jail on a corruption case. About 20 MLAs are reportedly supporting Mr Dinakaran. While there is speculation that Prime Minister Narendra Modi will soon make changes in his ministry, party sources indicated a Cabinet reshuffle was due. The AIADMK, which has 37 and 13 members in the Lok Sabha and the Rajya Sabha respectively, has often lent its support to the government on key issues in Parliament. Its members also voted for the NDA's presidential and vice presidential candidates in the recent elections. Representatives of the JD(U), which is in power in Bihar and joined the NDA recently, are also likely to join the government.